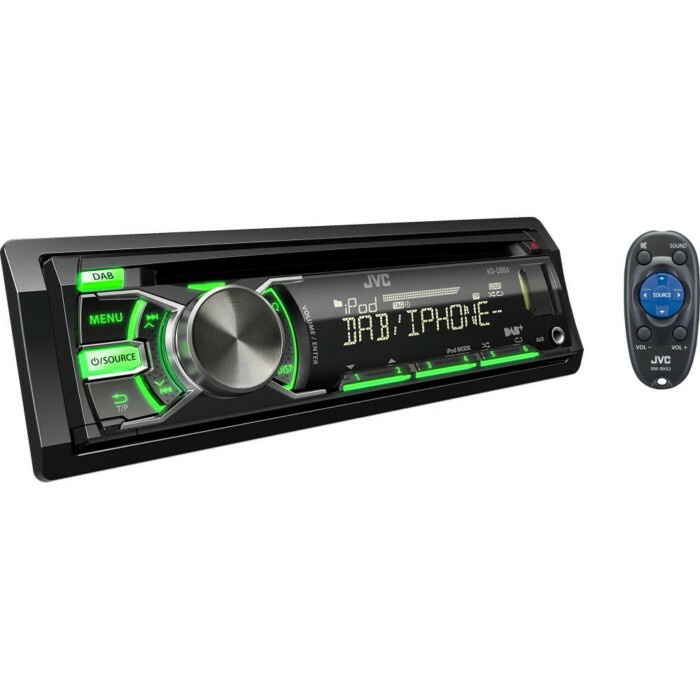 Get Digital Radio in your car with The JVC KD-DB53AT DAB Car Stereo. JVC were the pioneers of the new generation of DAB radios so you will be assured quality with this headunit. 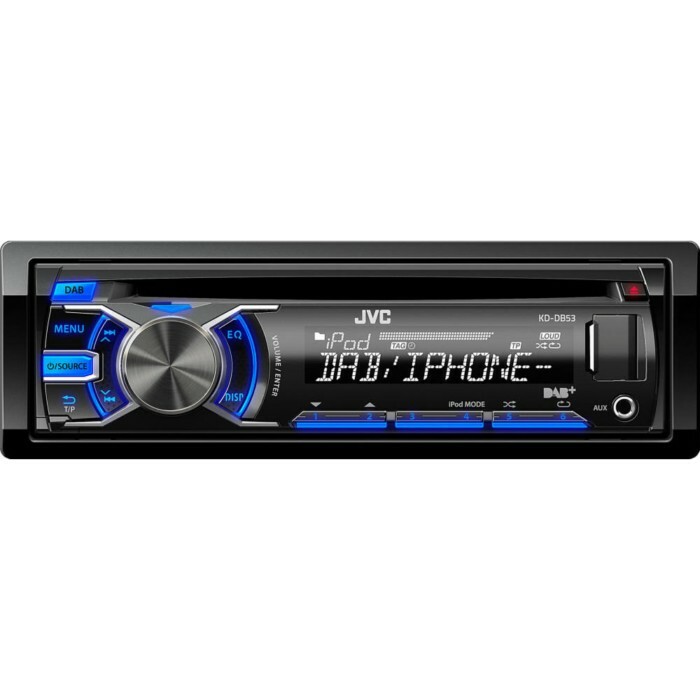 Make sure you are ready for the DAB revolution with the superb JVC KD-DB53AT DAB/USB/CD Receiver. Able to support all of your favourite existing formats, this receiver is the product of over 10-years of JVC research and development into DAB. This very latest model also offers a USB port with two-way control for iPod/iPhone and will even reproduce the sound from external apps. The JVC KD-DB53AT will connect to most currently available digital music sources. Connect to an external amplifier for extra quality using the full-range and subwoofer outputs and enjoy proper sound in your car! Fully variable illumination allows you to configure the front panel so that the display matches your dashboard whilst the controls stand out when used in low light. *1 Compatibility with 2-way control for iPod/iPhone differs by model. *2 Not compatible with DRM-protected music purchased from iTunes Store. *3 Not available for DAB. Hey guy's just wanted to write a little review about the JVC KD-DB53At I had installed by one of your stores a while back now. I didn't really want to pay 2-300 quid for a unit when I really only drive my car a few times a week on short runs but at the same time I really wanted to go for a unit with DAB radio, the price and features of this JVC DAb radio was just what I was after and I have to say it's very easy to understand without having to sit there for ages studying the user manual! I picked up most of the functions with the demo I was given after installation, in short great unit, impressive dab reception and best of all I now have a remote control sweeeet! The dab antenna is hardly noticed until pointed out, to be honest I thought this would use the same antenna so I guess it's good I went to the pro's to have this sorted for me! Thanks again guy's absolute legends. Can I use a Bluetooth dongle on this to play music on my mobile? Can I fit a metal dab arial instead of using the stick on glass one supplied. You can use a roof mount dab aerial. I'm looking to replace the standard radio in my Alto with this radio. What else would I need?? i.e. DAB antenna? anything else I would need? I had a Sony unit CD & Radio fitted new in 2000. (Grey import VW with no unit fitted). 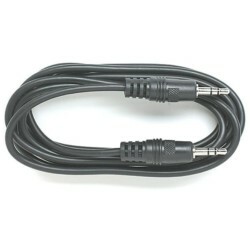 I am of the understanding that the wiring loom to the stereo required (a link cable) is this unit compatible ? I was hoping I can buy it from you in exchange of the one I have (it's in almost new condition, been plugged in for less than a month). Can you let me know if you can offer part exchange?